Labuan Bajo is one of the tourist destinations in Eastern Indonesia that is skyrocketing in popularity. It is said that Labuan Bajo has the best snorkeling spots in the world after Raja Ampat. In addition, the attraction of Labuan Bajo lies in its island cluster. Therefore, most of the travelers aim to explore those beautiful islands. Labuan Bajo is not that far if you know how to go to Labuan Bajo from Jakarta. You can take direct flights to Labuan Bajo. There are three airlines that offer the route Jakarta – Labuan Bajo, namely Batik Air, Garuda Indonesia and NAM Air. Flight time is around two and a half hours. Airfare rates start from Rp 2,000,000. Labuan Bajo has many interesting islands to visit. However, the distance varies from one another. Some are far from Labuan Bajo, some are close. A few islands take 2 hours of sailing while others require 4 to 5 hours of sailing. To visit all the islands, normally travelers need to sail for 3 to 4 days. They will live on board on big wooden boat. But for those who are on shoestring budget, there are also boats that provide one day trip. The cost is certainly much cheaper. If 3 days of sailing trip requires a budget around Rp 3.000.000 per person, one day trip only requires around Rp 500.000 per person (with minimum of two participants). In addition to one day trip, travelers can still enjoy the exoticism of Labuan Bajo ranging from meeting komodo dragons to snorkeling to see the stunning fish and coral reefs. 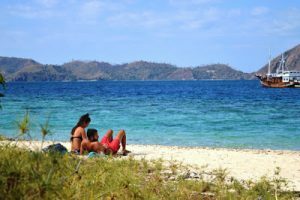 As you already know how to go to Labuan Bajo from Jakarta, below are some of the favorite spots that should be on your itinerary. It is the closest to Labuan Bajo. Kelor Island is small and has a cone-shaped hill in the middle. Travelers who come to Kelor Island must try climbing to the top of the hill. Although its height is average, the hill is quite steep and slippery. The slope is almost 60 degrees. It takes great effort to get to the top. 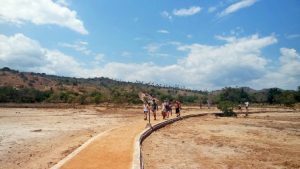 But once you are on top of the hill, you will have the luxury to see a breath taking view that you’ve never seen before. Kelor Island is uninhabited. If you want to stay here, you must set a tent. In addition to camping, you can also swim and snorkel. Kelor Island is one of the best spots to see the colorful coral and fish. Komodo National Park was established in 1980 and was declared a World Heritage Site by UNESCO in 1991. Not all islands in Komodo National Park can be visited by tourists. 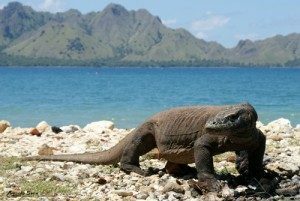 The islands that can be visited to see komodo dragons are Komodo Island and Rinca Island. To explore Komodo Island, you will be accompanied by a ranger. 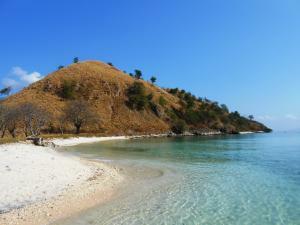 The contours of Komodo Island and are hilly and the hot weather will surely drain your stamina. Stay alert when meeting with komodo dragons. However komodo dragons are wild animals and their bites are deadly. To get to Komodo Island you have to rent a boat that costs starting from Rp 1.5 million / day. It would be cheaper if you joint with friends or other tourists because the capacity of the boat can be for 5-15 people. The trip to Komodo Island from Labuan Bajo takes about 4 hours. The admission to Komodo Island for local tourists is Rp 90.000 while for foreign tourists is Rp 250,000. In the Komodo National Park, Rinca Island is the second largest island after Komodo Island. You can meet up close and personal with the amazing komodo dragons. Here there are thousands of free-living komodo dragons. Tracking in the island will give you a better chance to see them. Tracking is divided into three categories, namely short, medium, and long. Short tracking has a distance of about 2 kilometers while medium tracking is about 4 kilometers and long tracking is about 7 kilometer. In addition to meet komodo dragons, you will meet with other wild animals living on the island such as buffalo, deer, and wild boar. The admission to Rinca Island has been included in the admission to Komodo Island, so you don’t have to pay anymore. Kanawa Island has a very exotic resort made of wood and facing directly into the blue sea. Even though it is a resort island, Kanawa Island is open for travelers who just stop by to take pictures. Besides its white sand, Kanawa Island is famous for its clear waters. Here there are thousands of beautiful coral reefs and colorful fish. To enjoy this amazing view, snorkeling is definitely the best way. Strolling around the island is also fun. The panoramic view is really instagramable. Bidadari Island is located relatively close to Labuan Bajo. It is only two hours of sailing. The island has stunning underwater beauty. The coral reefs are healthy and the fish is abundant. No wonder travelers love to snorkel here. Its white sand is perfect for relaxing. Surrounded by numerous hills and blue sea, the peaceful atmosphere will take you away from the hustle and bustle of life. No visit to Labuan Bajo is complete without paying a visit to Pink Beach. The pink color of the beach is a mixture of the color of white sand with debris from amoebas Foraminifera which has a red body shell. Pink Beach also has the underwater beauty that deserves to be enjoyed. There are various types of fish, thousands of coral reefs and various other marine biotas. 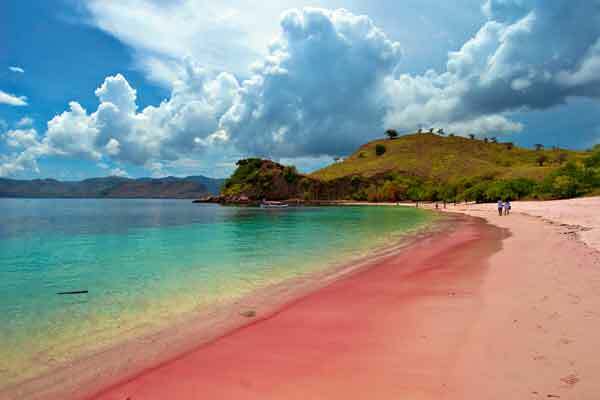 Pink Beach is located on Komodo Island. From the pier of Komodo Island you need to walk about 4 hours to get to Pink Beach. Or you can rent a boat. The journey takes only 30 minutes. The admission for domestic tourists is Rp 10,000 and for foreign tourists is Rp 50,000. All right, after knowing how to go to Labuan Bajo from Jakarta, it turns out that Labuan Bajo is easy to access. It’s only two and half hours away. The amazing komodo dragons, beautiful islands and panoramic view will happily greet you. Let’s visit Labuan Bajo..!